Sam Houston rolls over in his grave. From time to time, we've reported on the TSA's sexual assaults under cover of authority conducted openly and in full view of the public, in airports all across the nation. Absent a few scattered bleats, Americans have pretty much put up with behavior that would have driven their ancestors to arms. Why? 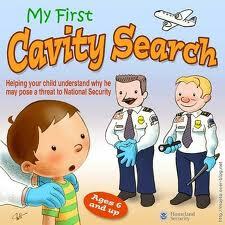 The fact is, the TSA cannot ensure the safety of any flight - not even one the First Lady's on. Of course, neither she nor her daughters have to endure the pawing hands of TSA minions, despite her being friends with confessed terrorists unlike most of us. The fact is, as we all know, the TSA has accomplished nothing whatsoever as far as keeping us safe. The underwear bomber is merely the best-known example of a terrorist the TSA didn't stop. The fact is, despite repeated requests, the TSA has never named one single terrorist or terrorist plot that their "officers" have managed to catch. Yet somehow, this petty tyranny manages to threaten to shut down the transport network of an entire state, and gets away with it! The bill went down to defeat, with committed supporters in Texas' Senate changing their positions at the last minute. They didn't want to risk killing their airline hubs in Dallas and Houston. Fortunately, some of their constituents are made of sterner stuff. Accusations of treason against wimpy senators may be a bit much; the real traitor is U.S. Attorney John E. Murphy who dared to blackmail a sovereign state in support of sexual predators. Cowards, though, they surely are. I walked through … right behind me there was a grandmother — little old lady, and she was was patted down... Right behind her was a little kid who was patted down. And then right behind him was a guy in Arabian dress who just walked right through. Why are we patting down grandma and kids? Why indeed? Because Mohammad might blow you up if you get too close. Granny won't even slug her uniformed attacker. Where was the outrage when TSA was first formed? No doubt chanting "Bush lied, thousands died!" "Where was the outrage when TSA was first formed?" Not NEARLY enough conservatives were as outraged as they should have been about the creation of the TSA. Libs were - and still are - perfectly fine with the concept, as long as they personally never get groped of course. I sorrow at how how far we have gone in reacting to 9/11. Patrick Buchanan said many years ago, that fascism will come to America “drip by drip”. Long before that the Founding Fathers warned against the tyranny that would arise from within, by scheming men pointing to “enemies without”, whether real or imagined. There is a natural law that grants each of us the right to travel. There is no curtailment of that right. Here is, however, an interference with the use of the power that comes with the right. Thomas Paine wrote that our rights are perfect. The power to exercise those rights is defective. No man or woman who purchases a ticket to fly is absolutely compelled to fly. If, for any given 72 hour period, no airline tickets were purchased, most of the business in the United States would come to a grinding halt. Business meetings canceled, weddings postponed, vacations taken at home, etc. would bring the airline industry to its knees. The taxes not collected would bring the government(s) to its knees. To have all of that happen would not be good in the short term, but in the long run, the government would realize that the power to govern is held in the hands of the people. And if, at the same time, all televisions were turned off, no magazines or newspapers purchased, and all long haul truckers parked their trucks along the highways, the the fools in the government would come begging us to start spending money. Of course, none of that will happen, but what if only 10% of it happened? “What have we become?” asks Hobbes. And then when issues like this come up there is the immediate knee-jerk reaction of the “Left/Right” wedge mongering, which is already apparent in comments here. Such as Ifon's “Libs/Conservatives” quip. Or the incoherent comment by Patience, which is most likely meant to defend against this being any of GWB's fault, because obviously he's not in power anymore. Even though TSA is an establishment created under the fascist regime of “Homeland Security”, an artifact of the Bush regime. Or I could point out that the PARTIOT Act is nothing but an updated version of the 1933 Enabling Act, brought to Nazi Germany after their false flag version of 9/11, the Reichstag Fire. It is very much so Robert Walker, such organized "passive resistance" would certainly put the fear of God into the Corporatist State. Anyway, my point in asking where the outrage was should have been self-explanatory, but leads to a more interesting question... Of the public figures and elected officials who now oppose TSA, how many of them said nothing when TSA was created? Why? Noting that in Auld English your name means "batman", as per the differentiation of the human gender; "Wereman" and "Woman"; and the ever popular, Wolfman, ie; werewolf. But to your question of "why" these officials said nothing when all of this began--the PATRIOT Act, Military Commissions Act, etc. Don't forget the atmosphere of fear created against any who would oppose such draconia. From the mailing of Anthrax to Senators who were opposing the PATRIOT Act, to TV announcers loosing their positions, and anyone against such measures being designated as “unpatriotic and UnAmerican,” Recall, “If you aren't with us you are with the terrorists”~GWBush. It was in this state of PR driven hysteria that all of these laws were put into effect. Bush was basically forced into creating DHS after 9 months of political firefights. The Homeland Security Act was passed by a Republican House and a Democratic Senate. Republican congressmen can be blamed for participating in creating it, but Democrats deserve equal blame, and Bush tried hard to stop it - admittedly not as hard as he could have since he didn't veto it. But, as onerous and wasteful as the TSA has always been from Day 1, it was not abusive or tyrannical until relatively recently, after the election of a Democratic President and Congress. There is still a Democratic President in charge, so it is entirely fair to blame him for not replacing Napolitano with someone who respects American liberties, law, and federalism. Thank you Petrarch for clearing that up...Bush opposed it for 9 months yet still signed it into law at the bidding of his masters. How does the chatter and rhetoric of puppet politicians change the fact of the actual ACTS put in place during their tenure? It is my contention that all of the political theater is a Punch and Judy show. I have stated this before. The Obama regime is no less such a theatrical front. Nothing in your response negates the fact that the immediate post 9/11 era was one of deep trauma and fear and loathing designed specifically to put into construction this Panoptic Maximum Security State that saddles the nation at this time. This was the entire reason for the PSYOP known as 9/11—a psychological operation to drive the population into deep trauma. The game plan for how to take advantage of this, while the iron was still hot was already product from the work of the “think tanks”. The logistics and preps for Afghanistan were already in the pipeline, battle groups already in the region. "This was the entire reason for the PSYOP known as 9/11—a psychological operation to drive the population into deep trauma." HA! I thought something similar when I first saw it. Sometimes, alliteration plays games with the eyes.